When you want to clean a gravestone, there are of number of things to take into consideration. Is the gravestone stable enough to withstand the cleaning process? Do you have the proper tools and cleaning agents? Should you use any cleaning agents? The National Center for Preservation Technology and Training(NCPTT) has a great video and free downloadable booklet on their site. The video features Jason Church, NCPTT Materials Conservator, who is an expert in cemetery conservation. Last Resting Place (UK) - Lastrp.com demonstration of gravestone cleaning & equipment for the task. Omaha, Neb. – A new smartphone app is connecting families with previous generations like never before. The free RestingSpot smartphone application became available to the public last fall. Designed for the iPhone and Android platforms, RestingSpot uses GPS technology to locate and preserve a loved one’s final resting place on earth. No longer will family members and friends waste time wandering about cemeteries, relying upon outdated and confusing maps. Their family history can now be documented and shared with ease from their smartphones or computers. The app was designed by Omaha residents Brett Atlas and Scott Kroeger. After spending 45 minutes searching for his grandfather’s final resting place in a Chicago cemetery, Atlas contacted Kroeger to discuss the idea. The pair set out to eliminate the frustration for families, and create a platform that preserves and cherishes the memories of loved ones for generations to come. Once a location is added via the mobile app, a linked profile is instantly created on the RestingSpot website. Each RestingSpot webpage contains the person’s exact location, down to the precise GPS coordinates within the cemetery, and becomes a virtual home where family and friends can connect and share on birthdays, anniversaries and other meaningful holidays and events. The RestingSpot goal is to map every location in the United States by Memorial Day 2013. Atlas holds degrees from the University of Kansas and John Marshall Law School. Kroeger is a graduate of DePauw University. To learn more, visit www.restingspot.com, Facebook or Twitter. Originally published in Epitaphs Magazine Online #11, March 2012. Webster, Florida, hosts the biggest flea market in the state every Monday, and although I have been many times, there are always a few items that catch me by surprise. The treasures range from the beautiful to the bizarre: like a purse made from an armadillo pelt or a set of incredible measured drawings of locomotive engines made by a recently deceased model train enthusiast. But my most astonishing moment by far came several weeks ago, when I saw a man with a headstone for sale. Now, call me old old-fashioned, but pretty much the only place I expect to find a headstone is in a cemetery. I was shocked to see it just sitting there in the grass, as if it were some common place thing, or part of your standard flea market fare. As a self-proclaimed taphophile I would like to tell you that I already knew what to do, that I followed some sort of protocol and that I am writing this to tell you the textbook example of how to respond to this kind of situation. In actuality, I had no idea what to do. In the hope that others may be more prepared if they are faced with a similar circumstance, and that my plan of action will be expanded upon in the future, I want to share how things played out. “Good riddance,” I thought to myself, but that didn’t help that he still had the headstone. A thought flashed through my mind; what if I purchased the stone and shipped it up to the historical society in Salem? The logistics of such a scheme began flooding in and quickly eroded any hope of success: shipping a 120 year old, +25 pound, sugaring slab of marble through the mail from Florida to New Jersey... the stone probably wouldn’t survive the trip, and would likely arrive home in Salem as a pile of dust. Not to mention there’s no way I could afford the shipping cost. No, that just wasn’t going to work. I walked over and snapped a few photos with my phone. “Lucy H. Dubois... Asleep in Jesus.” My mother’s maiden name is Dubose, a common alternative spelling of Lucy’s surname. As I stood and prepared to leave, I wondered if maybe she and I are somehow related. She died when she was only a couple months old, and her parents had provided that headstone as a testimony to their love for her, and as a dedication to her memory. I understand that time marches forward, and that countless numbers of our forebears have slipped through the cracks of memory, but it didn’t seem right to leave this one teetering on the edge of that crack, just within reach. It wasn’t fitting, not for Lucy or for anyone, not even for the guy wheeling and dealing headstones at a flea market. But, I had nothing else to offer, and I left. Could I have called the police? I didn’t know what laws were at my disposal. Would they have taken me seriously? Would Mark have altered his story in the face of the law? Who knows? I went home and the bad guy got away. The next day I wrote an e-mail to the historical society in Salem, New Jersey, and relayed my experience. They got back to me promptly and explained that a cemetery had been relocated in the area some years back. They also confirmed that Lucy’s death was listed in the parish records, but her headstone had not been accounted for. They thanked me and said they that would put the word out so folks could be on the lookout for the stone. Hindsight being 20/20, I really wish now that I had jotted down the license plate of the car Mark was driving. If I had, the authorities could have easily tracked him down if they decided he was in violation of the law. Also, I wish I had just told him that I thought what he was doing was wrong. I may not have had the section and paragraph of some law, but maybe someone looking him in the eye and saying, “I don’t care how you’ve justified it to yourself, but that is a sacred artifact—it belongs in a cemetery with the rest of her family, and you should be ashamed of yourself,” would make him think twice about peddling gravestones. Heck, maybe he would have even done some soul searching on the drive back to Pennsylvania and returned it to the Salem historical society. But, like I said, hindsight is 20/20. At the time I was too concerned with keeping up my ruse that I was interested in buying the stone. Given the Jekyll-Hyde transformation once he saw through that ruse, I’d say he was keenly aware that what he was doing was wrong, and illegal. So the story may not have a happy ending, but the lesson is clear. I urge people not to remain silent if they see anyone selling headstones, or any form of grave good or funerary art. As individuals who value historic cemeteries, we have a responsibility to hold others accountable. If you see someone selling headstones or grave goods call the police, take photos, contact a local historical society, and inform the vendor that what they are doing is wrong, and there are consequences. I know I would appreciate it, and I’m sure Lucy would too. Please check out this list of cemetery symbols and icons, which has been provided by The International Association of Cemetery Preservationists, Inc. and Dusty Smith for educational purposes in the field of gravestone studies. Symbolism in artwork, whether paintings or on gravestones, reflects the culture which created the work and can have multiple meanings. This list is only a portion of such information that can be found in: “Voices from the Cities of the Dead: A Cemetery Reference Guide to Understanding Terminologies, Gravestone Art, Monuments, Abbreviations, Symbols & Icons” compiled & authored by Dusty Smith (with photographic contributions by Kourtnie James & Dusty Smith) © to Raven’s Loch Publishing House. Feel free to use these listings in your studies , but do not generate your own list for your own website or anything other than personal use using this one. Thank you! How can you find unmarked graves? It's a great question and one in which many people--particularly genealogists--have interest. Below are some links I hope you find helpful. If you have any suggestions, please send them my way. What is foiling? It's a process of placing--you guessed it--aluminum foil onto the face of a gravestone and gentle pressing it into the nooks and crannies of the words and images. It's a process that brings out the carving without doing a rubbing. Sometimes even photos don't do the trick. What an interesting alternative! 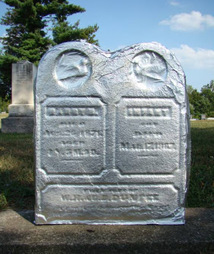 Have you used the foiling technique on gravestones? How did it go? Do you have any tips? Photos you would like to share with TheCemeteryClub.com audience? E-mail me! Note: The photo above belongs to Becky Wiseman and is from her blog Kinexxions.blogspot.com. Click on the photo to visit her blog and learn more about this awesome stone. She's beautiful, she's stately, she's a delicate flower. So what is UP with those hands? 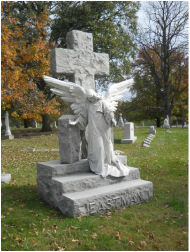 Endlessly gazing at the graves below her, the Eastman family plot angel is a thing of beauty and a representation of the contemplation of our impending deaths. 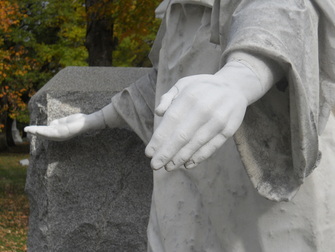 Apparently, someone at one point decided to give himself a hand (or two) and break off the angel's hands all the way up to the wrists. Some time later, her hands were restored. Well, not her original hands, but a reasonable--albeit HUGE--facsimile. 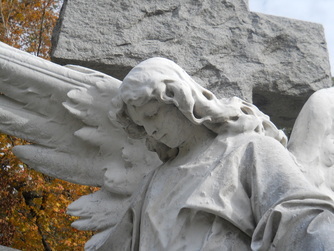 This lovely angel can be found in Crownhill Cemetery in Indianapolis, Indiana. These photos were taken by me in October 2011. Enjoy!